It’s very interesting how things come full circle. Allison Herrmann and I never could have imagined one year ago that we would be working at President Lincoln’s Cottage. We were just college seniors. I was a history major at Gettysburg College. She was a Gettysburg Semester student, spending the fall in Gettysburg for intensive Civil War studies under Professor Allen Guelzo. And we were touring the Lincoln Cottage, a building that at the time was in the thick of restoration work. Plaster hung from the ceiling and tell-tale green government tile still lined the walls. But the staff had big plans and brilliant ideas. Fast Forward a year now, as Allison and I now usher the same class around the site, now not looking nearly as scarred as it once did. The walls have been restored and the bare construction lights have been replaced by carefully recreated electrified gas-light fixtures. 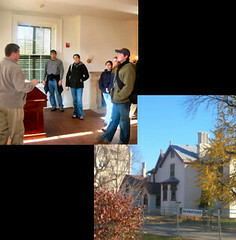 The Lincoln Cottage has come full circle in a year, from a building deep in restoration to an authentic historic site. Although the work in the cottage and visitor center isn’t complete and the site isn’t up and running, we were able to usher the students of the Gettysburg Semester around the cottage and give them a hint of what it will look like when it is completely finished. President Lincoln’s home is becoming quite impressive, and it was extremely enjoyable to finally be able to share the experience with some of the public at large. The stories in the Cottage are begging to be told, and getting on the ground, interpreting the history for the first time to visitors, was an extreme pleasure. Mr. John Rudy is an Interpreter at President Lincoln’s Cottage.